You could also use this in place of tortillas and even use this as a quick pizza snack by making a thick base and smother it with tomato sauce, toppings, cheese and throwing it under the grill. Or simply use it as a fabulous sandwich wrap. I’ve also make other versions with spinach and tomato paste in them to make colourful and tasty sandwich wraps. Feel free to go nuts and play around with it! Just eat and enjoy! The ingredients below make one wrap. Pour the batter in the pan and cook until firm on one side. Flip and cook on the other side. Use fillings of choice, roll, eat and enjoy! 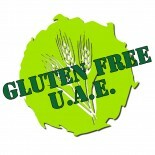 This entry was posted on 08/03/2012 by glutenfreeuae in Bread & Pizza, Lunch Boxes, Recipes and tagged gluten free, glutenfree, sandwich, wrap.